The Burnout formula is a simple one – crazy speed, big crashes, and, well, that’s really it. You’d think such a straightforward, yet well-loved series would be easy to keep running, but EA seems to have no interest in doing more Burnout games and, surprisingly, few have stepped up to fill that arcade racing niche. Enter Three Fields Entertainment, a small British indie studio started by Criterion Games founders Alex Ward and Fiona Sperry. 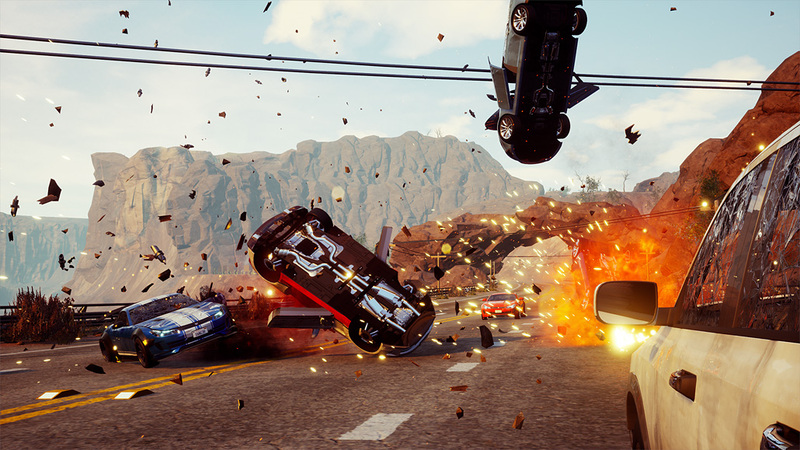 In 2017 Three Fields attempted to revive Burnout’s well-loved Crash Mode with Danger Zone, in 2018 they followed up with Danger Zone 2, and now we have Dangerous Driving on our hands. If you’ve ever played a Burnout game (specifically, Burnout 3: Takedown) you know exactly how Dangerous Driving works. As the game’s name implies. doing dangerous stuff (drifting, taking out opponents, driving on the wrong side of the road) will earn you boost, which you’ll usually burn as soon as you get it. Dangerous Driving definitely isn’t a game where you slow down around corners — you’re encouraged to take every hairpin turn at 200mph, which is easy enough to do, as the cars stick to the tracks like magnets. Sure, you can drift around corners, but it usually isn’t necessary. A few small tweaks and additions have been made to the Burnout formula (wrecked cars now remain on the road to be crashed into later), but they don’t really change the essential feel of the game. Dangerous Driving looks more or less the same as every other Unreal Engine 4 racer, which is to say, good, but not remarkable. Sometimes the game tries to get a little too fancy, with blinding lens flares and reflections obscuring the action. Of course, what really matters in a game like this is the sense of speed, and Tree Fields have definitely nailed that. Unfortunately, while Dangerous Driving has the basics down, there are a lot of things holding the overall experience back. Crash physics are seriously wonky, with your car bashing semi-trucks off the road one moment and exploding into shrapnel from a light brush against the guardrail the next. Glitches are rampant, with your vehicle crashing into literally nothing or randomly veering off the road on a frustratingly regular basis. The game’s track design won’t win any awards either. Three Fields claims the game has 31 tracks in all, but there’s actually only seven locations, each with a handful of alternate course layouts that retread much the same ground. These locations are all inspired by American national parks, which is a fine, but overused theme. The real issue with the tracks is they’re just too long, with single laps often taking three or four minutes, and full races sometimes stretching to around the 10-minute mark. That’s fine for a more deliberate sim-style racer, but it’s borderline too much for a game of this intensity. Classic Burnout races could also be a touch long at times, but they were never this drawn out. Dangerous Driving’s issues with track design are only magnified by the game’s egregious rubber-band AI. No matter how well you’ve been racing, your opponents are almost always just a step behind you – wipe out while in the first place, and, more often than not, you’ll drop directly to the back of the pack. A single crash can screw you at any moment, making Dangerous Driving’s overly-lengthy races stressful rather than exciting. And if you do manage to avoid messing up, your reward is…boredom. Your opponents all stick together in a clump, so you’re always either playing catch up or in the lead. The give and take and satisfying feeling of gradually working your way through the pack you get from a good racing game is completely missing here. Oh, and another AI oddity – I swear using boost actually makes passing opponents harder, as it seems they automatically increase their speed to match yours. Often, I found the best technique was to pass everybody while going normal speed, then just use boost to pad my lead. When you first boot up Dangerous Driving, you’ll find you have only one option – Dangerous Driving Tour, the game’s bog-standard career mode. You win races to unlock other races until there are no more to unlock. That’s it. You don’t earn money or upgrade your cars, and you have no choice in how you progress through the challenges. You can also earn new cars, but don’t expect any cool real-world vehicles. Needless to say, upgrading your generic SUV to and generic Advanced SUV is less than thrilling. At least Dangerous Driving offers a decent variety of race types (nine in all), although they aren’t all created equal. 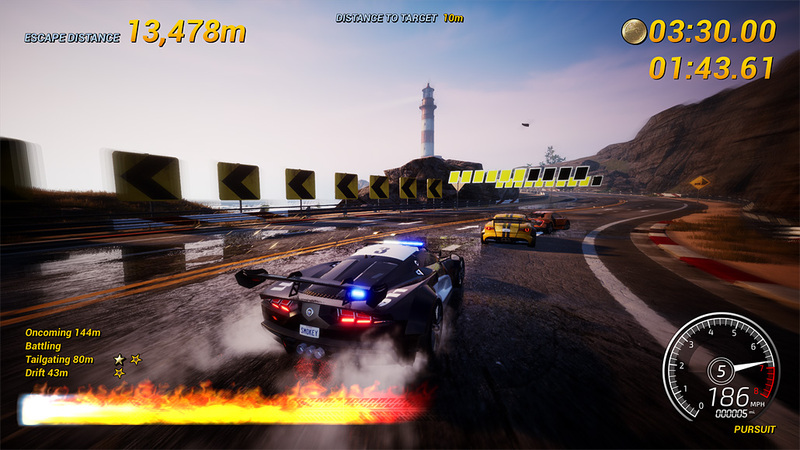 Standard races are just fine, Pursuit and Road Rage are solid smashy fun, and Heatwave, which lets players chain together boosts for non-stop edge-of-your-seat speed, is rather clever. On the flip side, Shakedown and Survival are uninspired time attacks variations, Face Off is a glaring showcase of the game’s AI problems, and Eliminator and GP are longwinded grinds. The lack of Crash Mode is definitely a bummer (you have to pay an extra $20 for Dangerous Driving 2 to get that), but the ratio of good to blah race types is acceptable. The real issue is the Driving Tour, which continually forces you to play types of races you don’t like. This game desperately needs an exhibition mode or at least a more versatile career. Dangerous Driving may last you up to 20 hours, as some of the later races can get pretty tough, but there’s no denying this feels like a half-finished project. In addition to the issues and omissions laid out above, multiplayer is completely missing (Three Fields promises to patch it in at a later date) and the game eschews any sort of soundtrack in favor of barebones Spotify integration. The extras aren’t what makes the car, but if I’m not getting air conditioning, cruise control, or heated seats, I at least expect a reliable engine. Dangerous Driving provides neither. 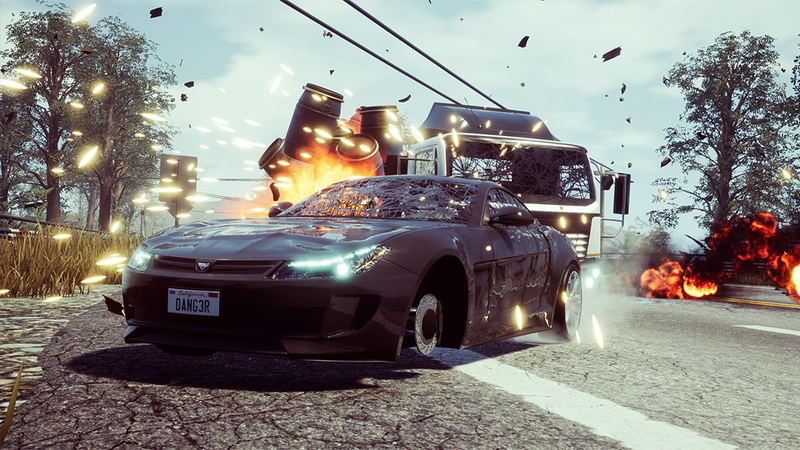 This review was based on a PS4 copy of Dangerous Driving provided by publisher Three Fields Entertainment. 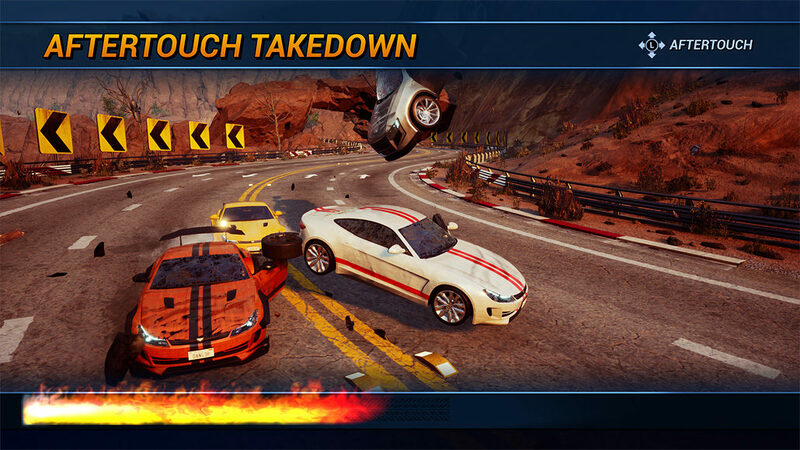 Dangerous Driving is, at best, a rough early prototype of a proper Burnout successor. The basic mechanics and sense of speed are there, but they’re badly undermined by bland track design, infuriating AI, a lack of features, and a host of other issues. Those feeling nostalgic for Burnout would be best served taking the classics out for another spin, rather than taking a chance on this lemon.